I get so excited when I go to a restaurant, try something new, love it, but think it is going to be really difficult to make at home because it has a fancy name. Then you do a little research and realize it's really, REALLY easy! That's the story behind today's recipe. Two Christmases ago I went on a ladies shopping trip with my church. We ate lunch at The Cheesecake Factory, and I tried the Chicken Piccata for the very first time. I thought for sure that it was going to be tricky to make because of the fancy name and complex flavors, but I was thrilled to discover that it couldn't be more simple. I know you are going to love this one and I can't wait to show you how I make it! 4 Boneless, Skinless Chicken Breasts, cut in half and pounded out to a 1/4 inch thick. To begin, you will need to cut the chicken breast in half. I do this by placing the palm of my hand on the top of the chicken breast, and with a very sharp knife, slice the breast in half. You may need to open it up like a book at one point to finish the job. Once you have cut the chicken breast in half place it on a cutting board and cover it with film wrap. Then, beginning with the thickest side first, pound out the chicken breast until it is an even 1/4 inch across. If you do not have a fancy mallet like this you can most certainly use a rolling pin. Once you have the chicken pounded out, take a moment and place your skillet over a medium/high heat and add the oil. While you are at it, place the flour on a shallow dish and add a little salt and pepper to that as well. Now dip the chicken breast into the seasoned flour and coat on both sides. Place into the hot skillet and cook for 2-3 minutes on the first side. Flip and cook for another 1-2 minutes on the other. Once the chicken cutlets have cooked through remove them from the pan and set to the side. I actually covered mine with foil to keep them warm while I made the piccata sauce. Speaking of the piccata sauce, it is time to get that going. To your hot pan add the wine and..
Let it cook until the wine nearly evaporates, about 2 minutes. Let that simmer for 1-2 minutes, taste for seasoning, make and adjustments, and then you are ready to plate. 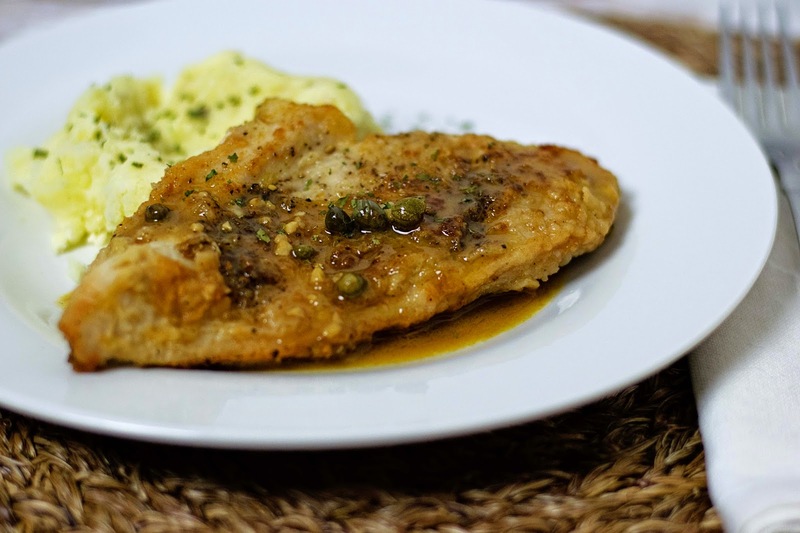 To serve this delicious Chicken Piccata I simple place the cutlet on the plate and drizzled the sauce over it. This way if you have some picky eaters in the house the can have "fried Chicken" and you can have something a little nicer! For side options you can whip up some garlic parmesan mashed potatoes as I did here, or some yummy steamed broccoli. This meal is the perfect way to kick off your week, serve for a dinner party, or simple just make for yourself whenever you want. I know your entire family is going to love it! Cut the chicken breast in half, cover with cling film, and pound out to a 1/4 inch thick with mallet or rolling pin. In a shallow pan, add the flour and season with salt and pepper. Dip the chicken cutlets into the flour on both sides and shake of the excess flour. Place a skillet over medium/high heat and add oil. Once skillet is hot add the cutlets to the pan. Cook for 2-3 minutes on one side, them flip and cook 1-2 minutes on the other. Once the cutlets are fully cooked, remove them from the pan to a place and cover with foil. Deglaze the hot skillet with the wine and add the garlic. Cook 1-2 minutes until the wine has almost completely evaporated. Now add the chicken stock, lemon juice, capers, and butter to the skillet. Let simmer for 1-2 minutes. 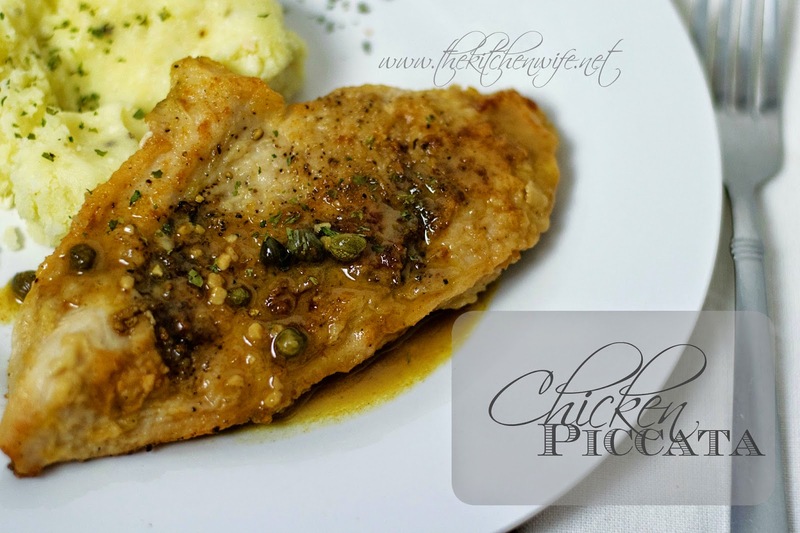 Place the chicken cutlet on the plate and pour a little of the sauce over it.